Now available in Bloomsbury Revelations series, Brecht on Performance: Messingkauf and Modelbooks presents a selection of Brecht's principal writings about the craft of acting and realising texts for the stage. It crystallises and makes concrete many of the more theoretical aspects of his other writing and illuminates the practice of this hugely influential director and dramatist. The volume is in two parts. The first features an entirely new commentated edition of Brecht's dialogues and essays about the practice of theatre, known as the Messingkauf, or Buying Brass, including the 'Practice Pieces' for actors (rehearsal scenes for classics by Shakespeare and Schiller). The second contains rehearsal and production records from Brecht's work on productions of Life of Galileo, Antigone, Mother Courage and others. 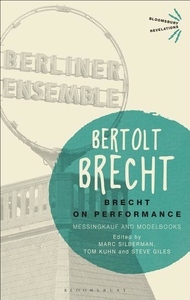 Edited by an international team of Brecht scholars and including an essay by director and teacher Di Trevis examining the practical application of these texts for theatres and actors today, Brecht on Performance is a wonderfully rich resource. The text is illustrated with over 30 photographs from the Modelbooks.